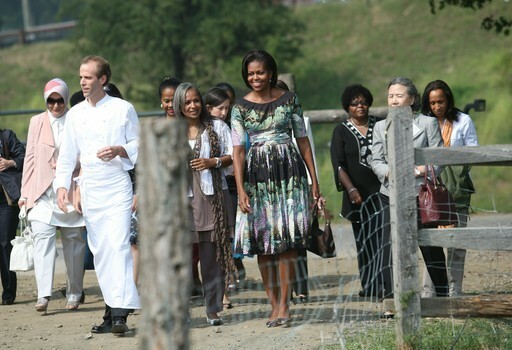 Last Friday afternoon, First Lady Michelle Obama met with students to tour a chicken coop and herb garden at Stone Barns Center for Food and Agriculture, located in Pocantico Hills, Westchester County, New York. The spouses of several other political leaders happened to be in New York at the time for the UN General Assembly and joined Michelle on this tour, a promotion of her healthy eating campaign. For this tour, Michelle wore a Tracy Feith wisteria print dress with cinched waist, in the style Mamie Eisenhower. She paired this look with silver flats and kept her accessories light, wearing only a simple pair of small dangle earrings. Do you like this “teatime” look on Michelle?